Rohingya refugee children carry supplies through Balukhali refugee camp near Cox's Bazar, Bangladesh, October 23, 2017. WASHINGTON - The United States is taking steps and considering a range of further actions over Myanmar’s treatment of its Rohingya Muslim minority, including targeted sanctions under its Global Magnitsky law, the State Department said on Monday. Secretary of State Rex Tillerson said on Wednesday the United States held Myanmar’s military leadership responsible for its crackdown on the Rohingya Muslim minority. Tillerson stopped short of saying whether the United States would take any action against Myanmar’s military leaders over an offensive that has driven more than 600,000 Rohingya Muslims out of the country, mostly to neighboring Bangladesh. The State Department made the announcement ahead of U.S. President Donald Trump’s maiden visit to the region early next month when he will attend a summit of ASEAN countries, including Myanmar, in Manila. It marked the strongest U.S. response so far to the months-long Rohingya crisis but came short of applying the most drastic tools at Washington’s disposal such as reimposing broader economic sanctions suspended under the Obama administration. Critics have accused the Trump administration of acting too slowly and timidly in response to the Rohingya crisis. Measures already taken include ending travel waivers for current and former members of the military in Myanmar, also known as Burma, and barring units and officers in northern Rakhine state from U.S. assistance, it said. “We have rescinded invitations for senior Burmese security forces to attend U.S.-sponsored events; we are working with international partners to urge that Burma enables unhindered access to relevant areas for the United Nations Fact-Finding Mission, international humanitarian organizations, and media,” the statement said. Interviews with more than a dozen diplomats and government officials based in Washington, Myanmar’s capital, Yangon, and Europe have revealed that punitive measures aimed specifically at top generals were among a range of options being discussed in response to the Rohingya crisis. The United States is taking steps and considering a range of further actions over Myanmar’s treatment of its Rohingya Muslim minority, including targeted sanctions under its Global Magnitsky law, the State Department said on Monday. 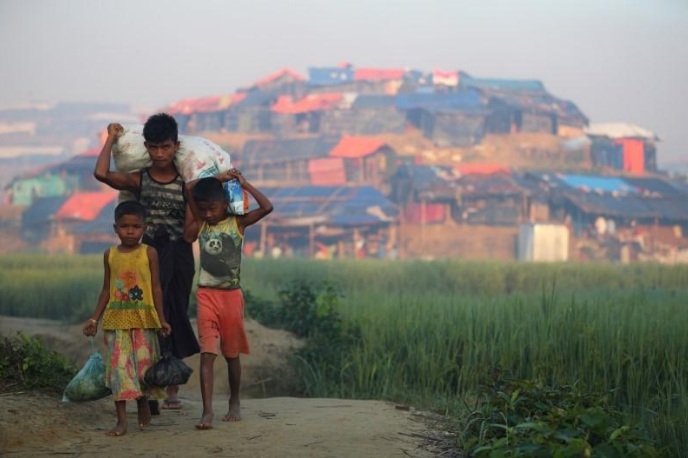 “We express our gravest concern with recent events in Myanmar’s Rakhine state and the violent, traumatic abuses Rohingya and other communities have endured,” it said in a statement.